Bite and Booze: Zorba's Bistro: It's All Greek to Me! When Zorba's Bistro reopened last year, many Baton Rougeans rejoiced. From 1984 to 2000, Zorba's had been a local favorite and one of the only Greek restaurants in the city to serve nothing but Greek food (as opposed to Greek and Lebanese fare). I had never been to the original Zorba's, but recently when Blair asked me what I wanted for lunch, I suggested we check out the new Essen location. Zorba's new location on Essen Lane has a cheery outdoor area. If the day hadn't been so rainy, I'd have insisted we sit outside. The new location has a lovely outdoor seating area, painted white with a vaulted overhead ceiling and patio umbrellas in shades of blue. The interior was just as nice. It was dimly lit with scenes of Greece and woven baskets lining the walls, and it offered us refuge from the rain. Our waiter, a family member of the owners, helped us choose our appetizer and main course. He recommended we start with the Chef's choice, cheese saganaki, or Greek kasseri cheese flambéed at our table and drenched in lemon juice. I'm not one to get excited about squares of fried cheese, but this stuff was amazing; crunchy and lemony on the outside, warm and gooey on the inside. We didn't start the fire! 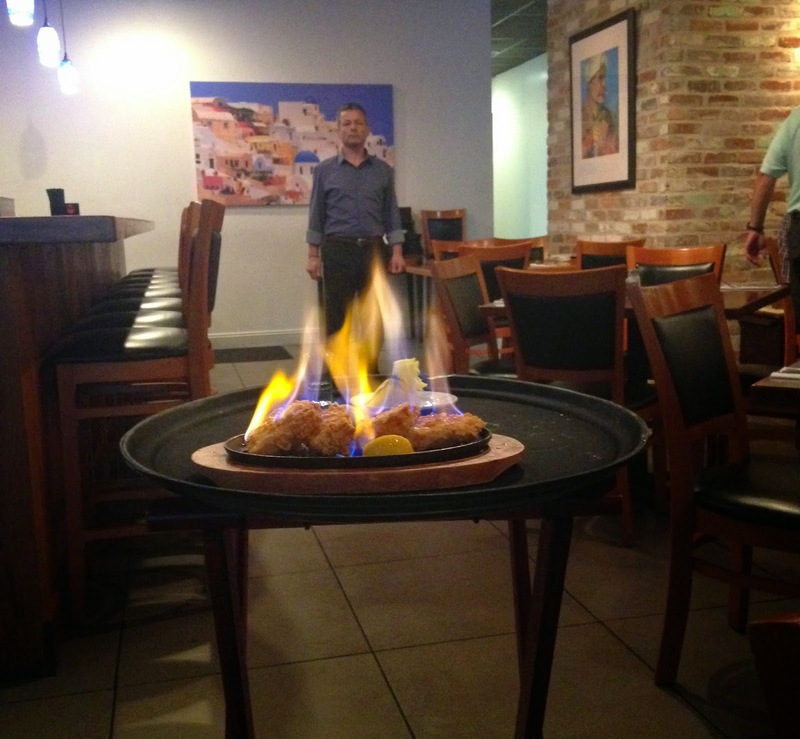 Our waiter lit our cheese saganaki on fire. 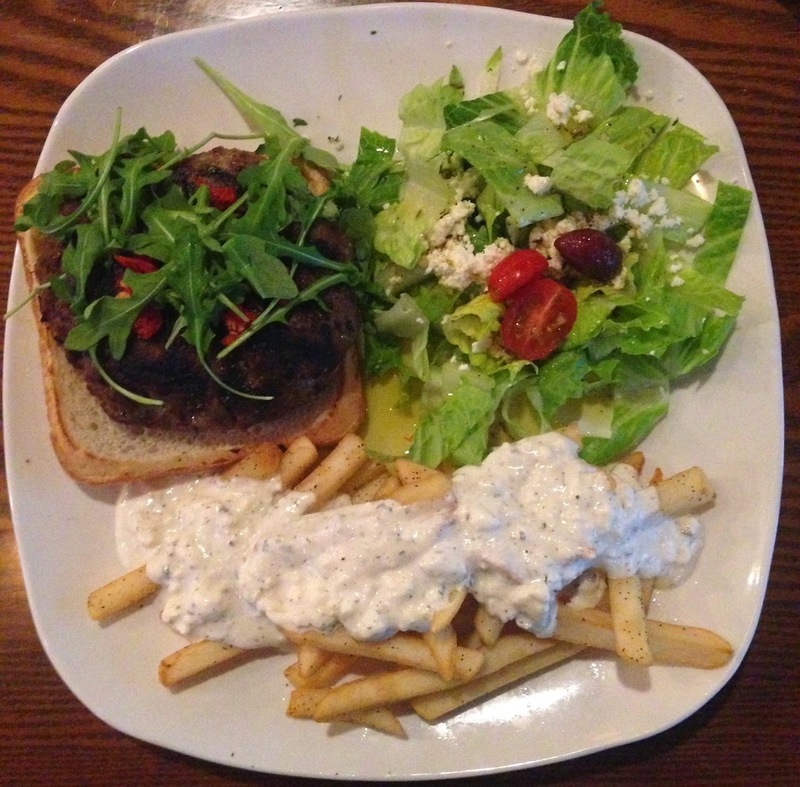 As per our waiter's suggestion, Blair ordered the Big-Z Lamb Burger, a thick portion of seasoned lamb meat on a bun topped with arugula and sun-dried tomatoes and served with Zorba's house salad and feta cheese fries. The burger was gigantic and juicy, but Blair and I were blown away by the feta cheese fries. I kept stealing fries off her plate. They were insanely delicious. We live for these feta cheese fries. I ordered the combination souvlaki, which was a massive plate of beef, chicken and gyros served with rice pilaf, Zorba's house salad and grilled bell peppers. This was perfect for people like me who are trying to watch their carb intake. It can be really hard to cut back on carbs, but this colorful plate made it painless (minus the rice pilaf). 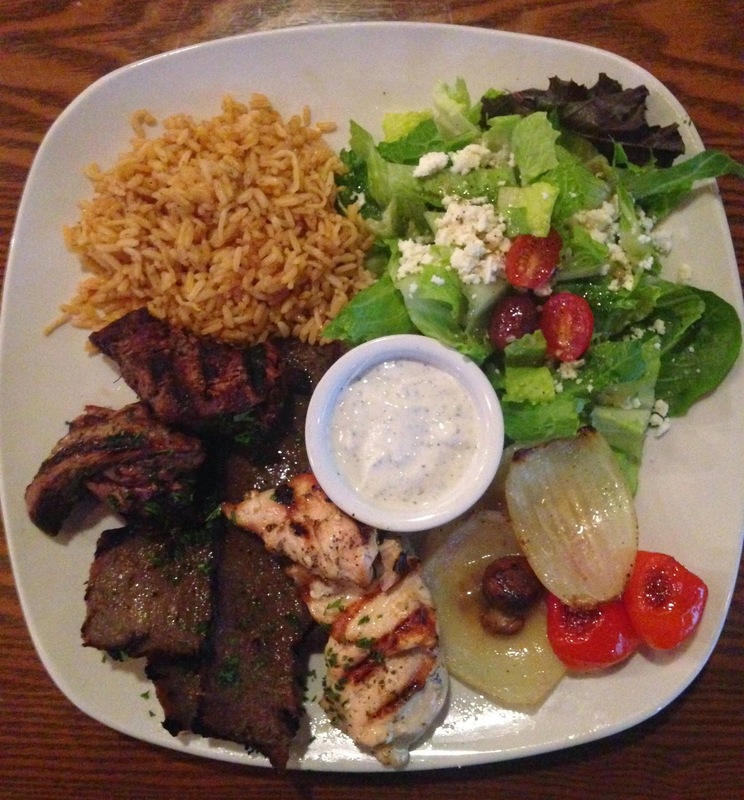 Chicken, beef, and gyros combination souvlaki plate with rice pilaf, salad, and grilled veggies. We were stuffed to the gills, so we passed on dessert, but we swore we'd try the baklava the next time around. And there will be a next time.